If you disconnect before 80% distance of the race is complete you will not receive any points. This all looks very smart. Good job Idiot and Zarf, Good job!! @LE MUNDO wrote: This all looks very smart. Good job Idiot and Zarf, Good job!! With 2 rounds remaining it seems its gonna be a blast for who 's finally getting on the podium in both divisions!! awesome stuff guys well done all drivers. congrats guys for the win of the championship! Great drivers both B1200 & BIGD. But we still have one round remaining, and i intend to get on that podium. i will give all i've got to get the checkered flag in Monza so be prepared Dave to receive the fight of your life lol. Congratulations @B1200 and Prancing moose motorsport! Zarf, that is absolutely ace. Thank you so much for producing that and for running the championship. It'll be going up on the office wall. I know how much work goes into those graphics and that's before you account for the admin involves with running everything so smoothly. John (Sin), I wouldn't expect anything less than a great, clean fight from you at Monza. Best of luck to you. @BigDaveTheMighty wrote: Zarf, that is absolutely ace. Thank you so much for producing that and for running the championship. It'll be going up on the office wall. Congratulations BigD for getting on the podium. Though i managed to get on poll in Monza, this ginetta car betrayed my hopes once again dropping me from 1rst place to 6th with race launch. Though the ginetta is a master in flying laps if you drive risky and can get you awesome hotlap times, it prooved to be a total parody of a gt3 class, its a car that feels like is taken out from the age of a 60's generation car when driving it with loaded fuel,it simply doesn't like to run with a loaded fuel tank period. Proud to get that 4rth overall though. Congrats to all contenders on both divisions. Hope a new series starts soon. Well done Zarf on the championship win. 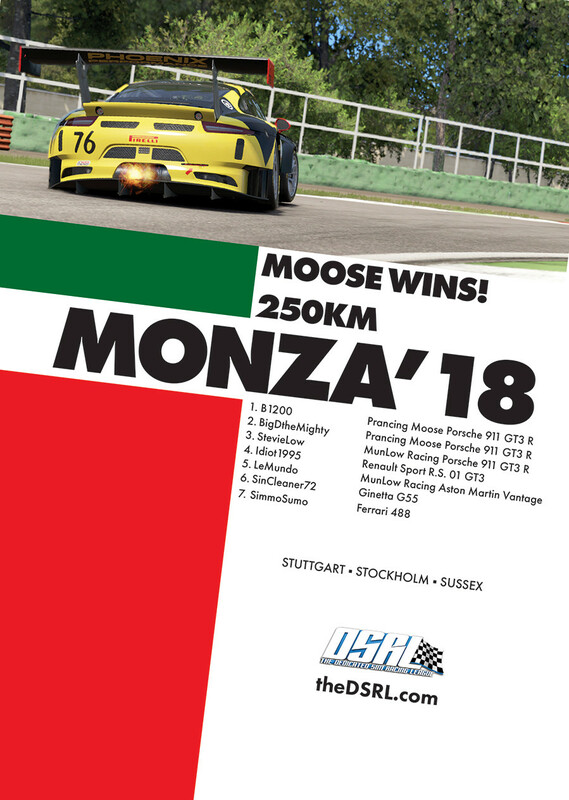 Well done team Moose on the team win. I really enjoyed this season racing with you guys, was very sceptical due to the work in progress status of PCARS2 but managed to get through the season with just 1 race affected by the game. That was a great season. Big thanks to Zarf and Idiot for running everything so smoothly. @BigDaveTheMighty wrote: That was a great season. Big thanks to Zarf and Idiot for running everything so smoothly.